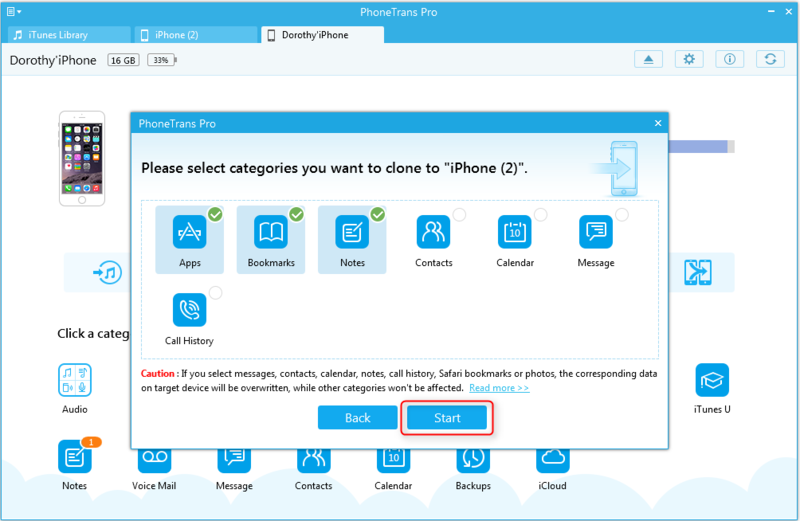 PhoneTrans Pro assists in copying selected contents from one iPhone to another, whatever Music, Playlists, Movies, Ringtones, Voice Memos, TV Shows, Music Videos, Home Video, Voice Memos, Camera Roll, Photo Library, Photo Stream, Albums, iTunes U, or Notes, Message, Contacts, Calendar, Call History and App. 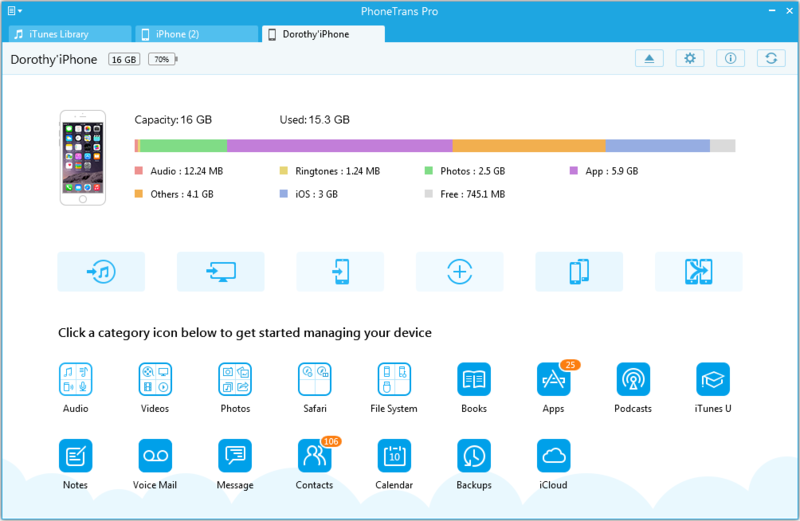 Through the selective clone feature, you can copy your favorite data from one iPhone to another. Please check the internet connection is normal（both computer and device）when using clone feature. Warning: Please don’t disconnect your iPhones while cloning data, or the data will be erased permanently. So please ensure the USB cables connect stably. Step 1: Launch PhoneTrans Pro after connect two iPhones to computer. Then, the main interface will appear. 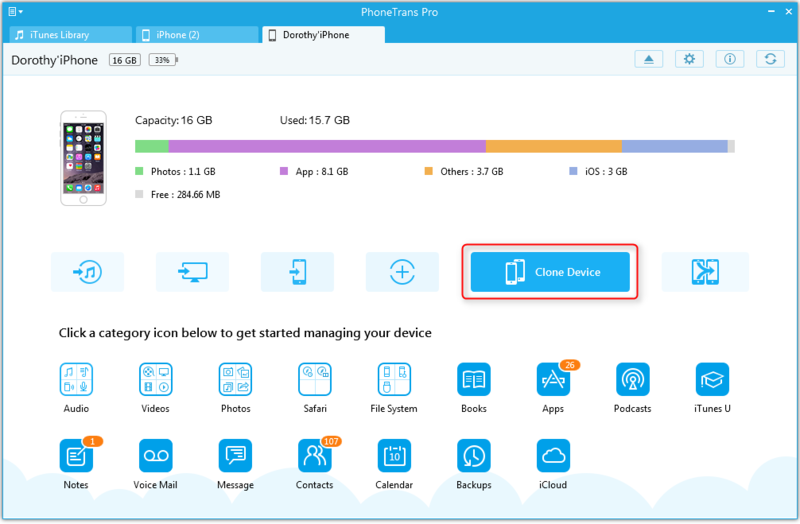 Step 2: Please choose one iDevice as target device, and click “Clone” button. Then, the clone management interface comes into sight. Step 3: Please choose some data you want to clone, whatever songs or messages, etc... Next, you will start the selective clone process. If the data is too large, we highly suggest you to clone according to data classification (eg: media files, personal information, apps, etc). By this way, it enables you to clone data high-efficiently.